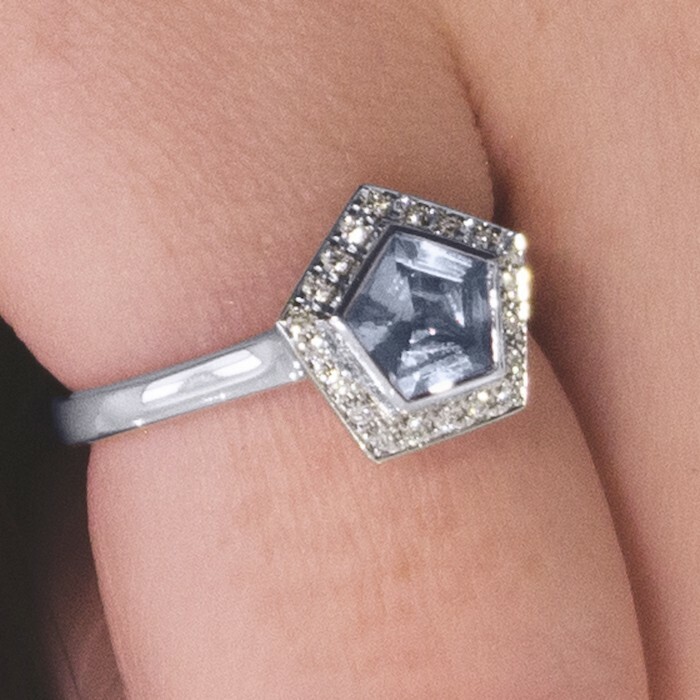 If you're looking for an engagement ring with traditional elements that is totally different, this ring will be something you'll want to take a close look at. 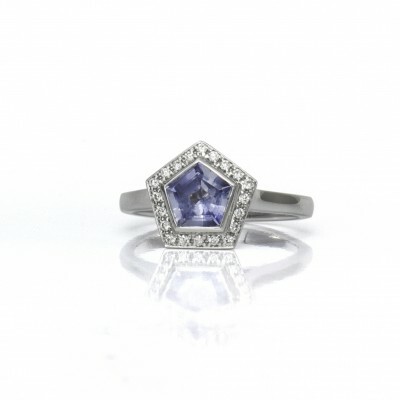 The centre light blue sapphire is a pentagonal step-cut, a cut that is very, very rare. We've set it in a bezel with pave diamonds surrounding it for a classic-meets-modern effect. This ring is simple, understated and elegant, yet unusual enough that it still makes a statement. 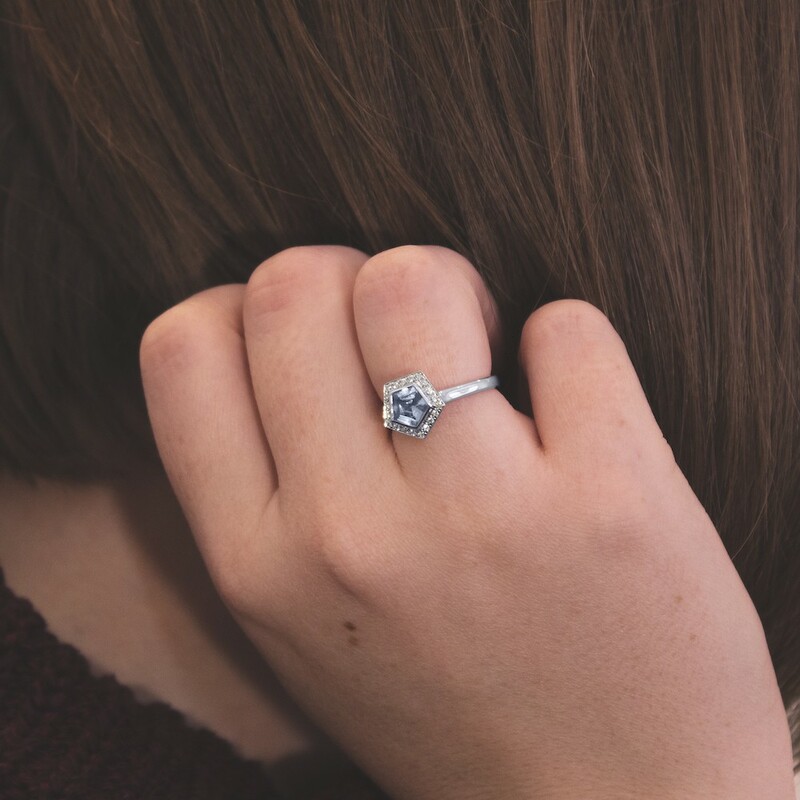 Our goldsmith Ali picked this ring as her favourite ring for our "Studio1098 Staff Picks" because "The combination of the icy blue colour and the shape of this sapphire makes this ring unique and beautiful. It reminds me of both a winter landscape and a cool summer day at the same time. No one will be able to resist this interesting beauty!" There are many shades of blue sapphire, which occur naturally when a sapphire crystal grows in the presence of titanium. The lighter colours, often from Sri Lanka, are usual described as "cornflower" or Ceylon sapphire. The darker colours are often described as Kashmiri, as the best of these stones come from Kashmir. Montana sapphires (also a nod to origin) tend to be dark blue with a hint of green. There are a number of famous blue sapphires, including the sapphire that Prince Charles selected for Princess Diana (now Kate's) sapphire engagement ring. Sapphire is the traditional gift for celebrating a 45th or 65th wedding anniversary or birthday, and it is also the birthstone for September. The name sapphire derives from the latin word "sapphirus", which means blue, and the Greek word “Sappheiros”, which means “precious stone”. 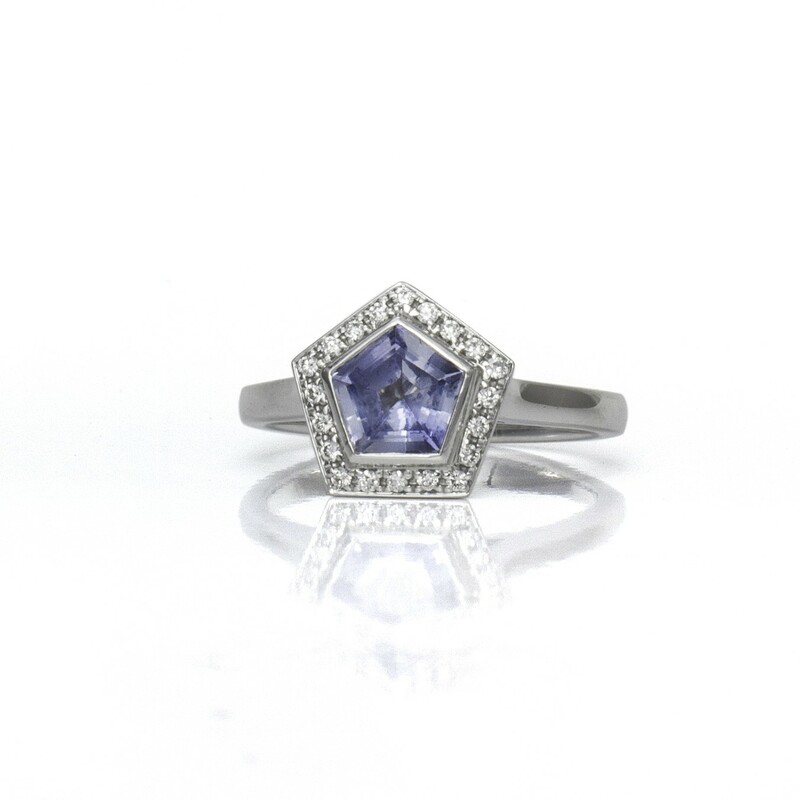 In ancient times, people thought sapphire could protect against evil spirits and creatures of the night.